The month of December is busy with preparation. Most of us spend time shopping, baking, and decorating to prepare for Christmas, but do we spend time preparing our hearts for the true gift of Christmas? 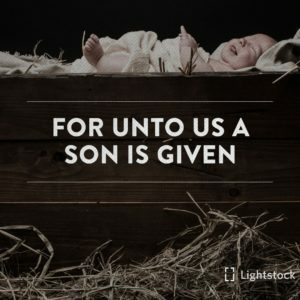 “To us a son is given.” Out of love, God gave us His Son. With this gift comes many kingdom blessings. May the Wonderful Counselor, Mighty God, Everlasting Father, and Prince of Peace be ever present with you and yours this month. Make plans to attend the Advent services on Wednesdays this month. Spend some time meditating on the many names and titles of Jesus and their significance in your daily life. Pray for the church staff, musicians, and volunteers as they prepare for the various services and celebrations through the season including the Christmas C-MENT production, the Christmas Chorus musical presentations, and the services on Christmas Eve and Christmas Day. Pray for those who will visit churches around the world during this season.